Abcam’s Human Insulin ELISA (Enzyme-Linked Immunosorbent Assay) kit is an in vitro enzyme-linked immunosorbent assay for the quantitative measurement of Human Insulin and Proinsulin in serum, plasma, cell culture supernatants. This assay employs an antibody specific for Human Insulin coated on a 96-well plate. Standards and samples are pipetted into the wells and Insulin present in a sample is bound to the wells by the immobilized antibody. The wells are washed and biotinylated anti-Human Insulin antibody is added. After washing away unbound biotinylated antibody, HRP-conjugated streptavidin is pipetted to the wells. The wells are again washed, a TMB substrate solution is added to the wells and color develops in proportion to the amount of Insulin bound. The Stop Solution changes the color from blue to yellow, and the intensity of the color is measured at 450 nm. This kit detects both insulin and proinsulin. 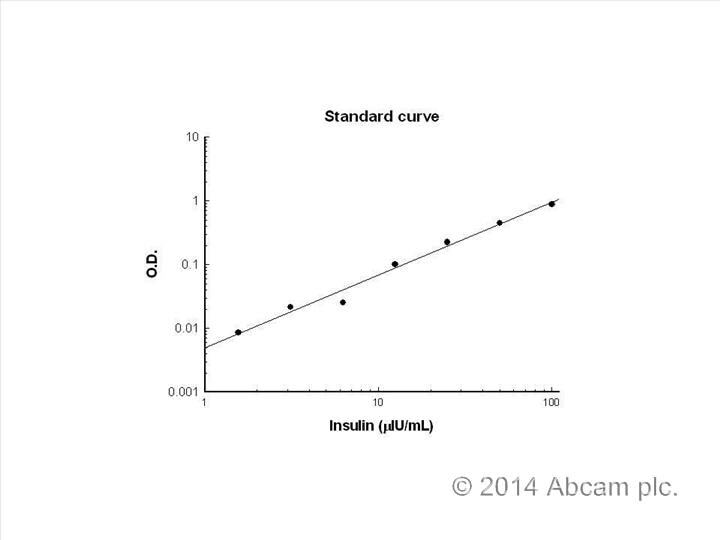 Get higher sensitivity in only 90 minutes with Human Insulin ELISA Kit (ab200011) from our SimpleStep ELISA® range. Optimization may be required with urine samples. Insulin decreases blood glucose concentration. It increases cell permeability to monosaccharides, amino acids and fatty acids. It accelerates glycolysis, the pentose phosphate cycle, and glycogen synthesis in liver. Defects in INS are the cause of familial hyperproinsulinemia (FHPRI) [MIM:176730]. Defects in INS are a cause of diabetes mellitus insulin-dependent type 2 (IDDM2) [MIM:125852]. IDDM2 is a multifactorial disorder of glucose homeostasis that is characterized by susceptibility to ketoacidosis in the absence of insulin therapy. Clinical fetaures are polydipsia, polyphagia and polyuria which result from hyperglycemia-induced osmotic diuresis and secondary thirst. These derangements result in long-term complications that affect the eyes, kidneys, nerves, and blood vessels. Defects in INS are a cause of diabetes mellitus permanent neonatal (PNDM) [MIM:606176]. PNDM is a rare form of diabetes distinct from childhood-onset autoimmune diabetes mellitus type 1. It is characterized by insulin-requiring hyperglycemia that is diagnosed within the first months of life. Permanent neonatal diabetes requires lifelong therapy. Defects in INS are a cause of maturity-onset diabetes of the young type 10 (MODY10) [MIM:613370]. MODY10 is a form of diabetes that is characterized by an autosomal dominant mode of inheritance, onset in childhood or early adulthood (usually before 25 years of age), a primary defect in insulin secretion and frequent insulin-independence at the beginning of the disease. Belongs to the insulin family. Our Abpromise guarantee covers the use of ab100578 in the following tested applications. Sandwich ELISA Use at an assay dependent concentration. 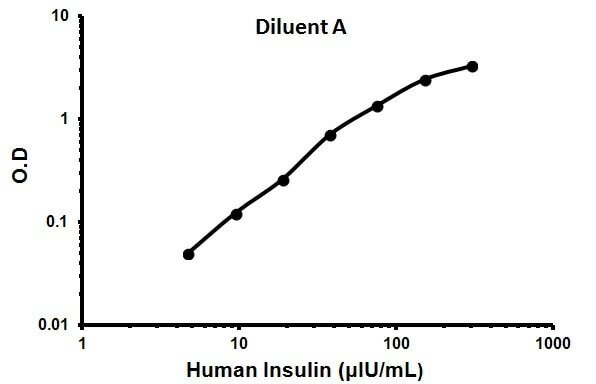 Human Insulin measured in cell culture supernatants showing quantity (µIU) per mL of tested sample. Samples diluted 1-2 fold. 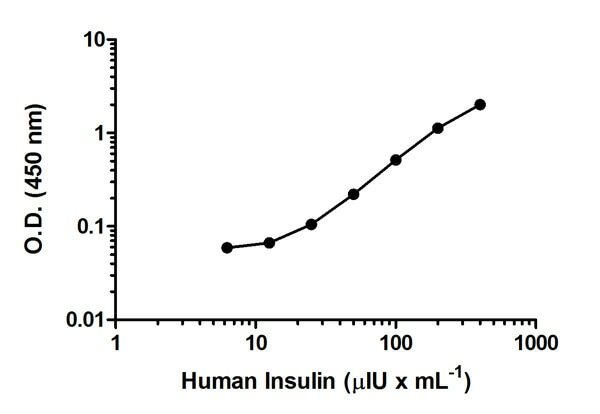 Human Insulin measured in biological fluids showing quantity (µIU) per mL of tested sample. Samples diluted 1-6 fold. Representative Standard Curve using ab100578. I am interested in testing the ab100578 kit in non-human primate plasma samples and was wondering about receiving a testing discount. Would this be possible? Thank you very much for your interest in ab100578. To our knowledge, ab100578 has not been tested in non-human primate. Therefore, I can offer a discount off a future purchase if you buy ab100578 now, test it in non-human primate and submit feedback to us in the form of an Abreview. It doesn’t matter whether the Abreview is positive or negative, we would just really like to receive your feedback. The discount would be to the value of 1 free kit of the same value. If you are interested in this offer, please follow these steps: 1. Reply to this e-mail to let me know that you would like to proceed and test ab100578 in non-human primate. I will then send a discount code. This code must be issued before purchasing ab100578 so please wait for my reply before ordering. 2. Purchase ab100578 either by phone, fax, or online (www.abcam.com). 3. Test it in non-human primate. 4. 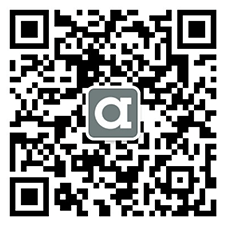 Let us know the results, positive or negative, using our Abreview system (this will take about 10 minutes and images are great if you have them!). To find out how to submit an Abreview, please visit: https://www.abcam.com/abreviews. 5. After the review is submitted to us, the discount code becomes active. Simply place your new order by phone, fax, or on the web and mention the discount code. The discount can be redeemed for any kit ordered and the discount code is valid for 4 months after issue. We are always pleased to obtain feedback about our products and any information is greatly appreciated! Even if ab100578 turns out to be unsuitable for non-human primate you will still receive the discount on your next purchase after your Abreview has been submitted. Please let me know if you have any questions about this offer and I would be happy to help you further. The Terms and Conditions of this offer can be found at: www.abcam.com/collaborationdiscount. We used the kit to detect insulin in normal WT mouse serum or plasma. We tested 1 to 25ul of serum or plasma per well but everything was BLQ. The standard curve however was beautiful so I believe this kit may work for other samples. In our case we switched to a more sensitive detection method. I'd like to use the kit for human EDTA-plasma samples. Does it work for EDTA plasma? I am happy to confirm that Heparin, EDTA and Citrate treated plasma samples were all tested with this kit and are all suitable. This is covered by our AbPromise guarantee. Plasma samples from pigs 3-4 months old (25-30 kg body weight) were obtained after overnight fasting. Assay procedure was performed according to manufacturer instructions. However, standard curve (duplicates) was modified due to the low concentrations observed in fasted pigs. 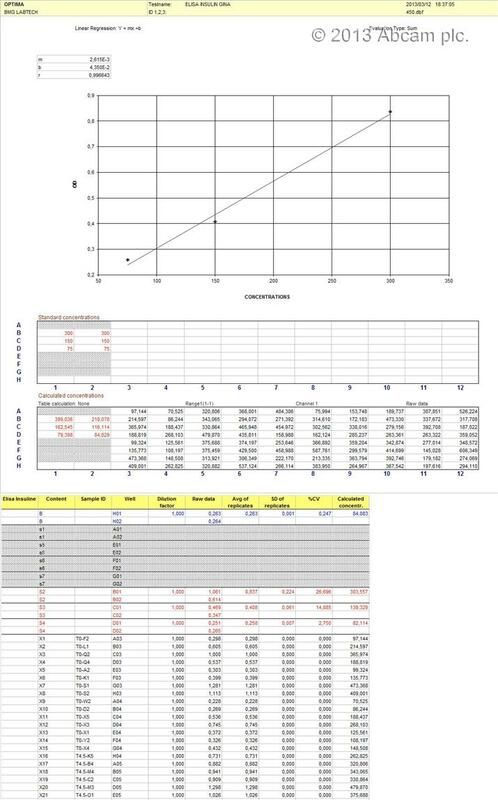 Standard concentrations were 100, 50, 25, 12.5, 6.25, 3.125 and 1.5625 microIU/mL, prepared by a 1:3 dilution of the first standard provided with the product, and consecutive 1:2 dilutions thereafter. Plasma samples were added to each well by duplicate (100 microL) as suggested by the manufacturer instructions, with no dilution. All remaining steps were performed in accordance with manufacturer instrucitions, with no modificatons. Readings were performed at 450 nm. Treatment A: 54.95, 9.29, 8.77, 5.10 microIU/mL (mean: 19.53±11.84). Can I use Insulin Human ELISA Kit (ab100578) to detect insulin in camel milk? If not, can you show me another test? We do not have data for camel samples tested with the human insulin ELISA, ab100578. However, insulin is well-conserved between the two species, so it is possible the ELISA will detect camel insulin. The pig insulin ELISA ab156515 will be a slightly better choice, since camel insulin is more similar to pig insulin than human. Click here (or use the following: https://www.abcam.com/index.html?datasheet=156515). Here are the percentage identity results of the alignments of camel insulin precursor with human and pig insulin. What is the experiation time for this kit? The kit can be used within 1 year if the entire kit is stored unopened at -20 degrees C. After opening, please refer to the protocol booklet for component-specific storage instructions. Inquiry: Dear all I am interesting on order the human insulin Elisa kit for plasma sample. I wonder about the sample volume how much should be? The general sample information for the Insulin Human ELISA Kit (ab100578) is a suggested dilution of normal serum/plasma: 2-10 fold (page 10 of the Protocol Booklet). We however recommend testing different dilutions such as 1:2, 1:5, 1:10 to determine which one is the best for your particular sample. Once the sample has been diluted, 100ul of sample should be added into appropriate wells and incubate for 2.5 hours at room temperature or over night at 4C with gentle shaking (remember to cover well the plate). For the following steps please follow the kit protocol at page 11 of the Protocol Booklet. This kit initially intended to detect human Insulin, successfully detect also rat Insulin in serum samples. Will this kit detect functional and non functional insulin? The antibodies used in this kit will recognize Insulin and Proinsulin. From the information which I have been able to gather on SwissProt regarding insulin (http://www.uniprot.org/uniprot/P01308) the insulin precuror is composed of a signal peptide, chains A, B and a C peptide. It seems that insulin is the heterodimer of chain A and chain B and that proinsulin contains chain A, B and peptide C. While I cannot be sure of whether the proinsulin is non functional it seems likely that this form could be compared to the functional heterodimer. If this is incorrect please let me know. Assuming that this is correct, then ab100578 will recognize both forms. I am sorry that I could not be more helpful, but I hope that the available literature in this area can provide some clarification. Please do not hesitate to contact us again with other needs or with any questions about our products. Les anticorps utilisés dans le kit ELISA ab100578 sont les anticorps ab8304 comme anticorps de capture et ab20756 comme anticorps de détection. Ces deux anticorps sont testés et garantis chez le rat. Le kit lui-même n’a pas été testé chez le rat mais il y’a des chances que cela fonctionne. Si vous souhaitez le tester, je peux vous faire une offre de test.